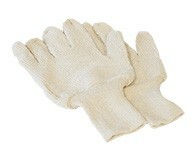 Hot mill and double palm gloves feature double layers of fabric in the palm, thumb and index finger area providing greater heat protection than single layer gloves. 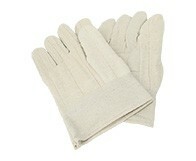 Heavyweight 30oz cotton gloves used in foundries and other environments that require the handling of hot objects up to 300o.The 28 oz Loop-Out terry cloth glove provides and excellent heat barrier while still giving you comfort and flexibility. Excellent for metal finishing applications as these will not scratch highly polished surfaces.